Few things in life are certain – aging is one of these certainties. Aging is unavoidable. Around the age of 30, we begin to lose 1% of our collagen each year. By the time we have turned 40, we have lost 10% of our total collagen content. This is due to a genetically predetermined process commonly referred to as intrinsic aging. Simply put, the balance between active matrix metalloproteinases (enzymes that digest collagen) and neocollagensis (the production of collagen) shifts towards overall collagen loss. There are also extrinsic factors that lead to aging of the skin, these include UV exposure (from the sun), gravity, environmental pollutants, and smoking. Sun damage (UV damage), is one of the most harmful, yet preventable factors leading to visible aging (not to mention skin cancer). UV exposure has been shown to increase wrinkles, causes thinning of the skin, hyperpigmentation, and sun spots (lentigines). These extrinsic factors lead to the production of oxidative stress, which is an overproduction of free radicals. Free radicals are unstable molecules that can damage protein, DNA, and lipids. Together, these factors cumulatively lead to undesirable changes to the skin. Scharffetter–Kochanek K, Brenneisen P, Wenk J, Herrmann G, Ma W, Kuhr L, et al. Photoaging of the skin from phenotype to mechanisms. Experimental Gerontology 2000 May;35(3):307-316. 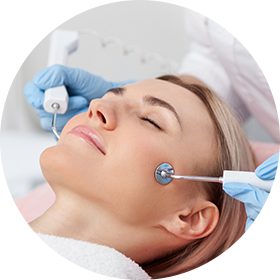 Due to loose standards in Canada, many laser and energy devices can be found in aesthetician offices and salons, which offer little (if any) medical supervision. If you are considering a laser treatment, we recommend that you select a licensed medical professionals clinic. At Hemingway Medical Spa, all of our laser procedures are overseen by Dr. Olesen. IPL stands for Intense Pulsed Light. This is not technically a laser, as it a wave-length spectrum, whereas a true laser is only one wave-length. IPL is commonly referred to as a “photo-facial”. What can IPL be used to treat? IPL can be used to treat vascular lesions (like small veins and telangiectasias), sun spots, and freckles. Some IPL devices contain a spectrum of wavelength that is beyond the visible spectrum that can also stimulate collagen production. What is the difference between a fractionated and non-fractionated laser? A fractionated laser delivers small ‘micro-beams’ which preserves the integrity of surrounding tissue, similar to aerating a lawn. Where as a non-fractionated laser causes thermal injury to the entire tissue. What is the difference between an ablative laser and a non-ablative laser? Ablative lasers essentially vaporize the entire layer of skin from the outermost of the skin all the way down to the end point. Non-ablative lasers preserve the outer layer of skin (epidermis) and only cause thermal injury to the underlying skin tissue. What laser is right for me? This is a question that you should not be answering on your own. There are advantages and disadvantages to all laser options. One needs to consider treatment objectives while balancing how much down-time you can afford. A medical professional can help you understand your options. What does it feel like like? IPL treatments typically feel like an ice-cube is being held to your face with an “intermittent and abrupt snapping sensation, like being flicked with an electric rubber band” (Dr. Olesen). A non-ablative laser treatment feels like a wave of warming which peaks after the treatment. Immediately after, the skin has been described as feeling like a mild sunburn. You will likely experience some redness and may experience minor swelling. The redness and swelling is usually resolved in 24 hours. Can laser treatments be combined in a single session? Yes, at Hemingway Medical Spa we offer a combination of IPL followed by a 1540 non-ablative fractionated laser. This treatment is known as the ThreeForMe™ as it targets: facial veins, age spots, and wrinkles. You should plan for 60 minutes to account for time for the topical anesthetic application and effect. The procedure itself usually takes about 15 – 20 minutes. You will be able to drive home after the procedure. You should plan to take the rest of the day off, but the procedure wouldn’t preclude you from doing essential errands or activities – you might just be a little red. When used appropriately there is minimal risk of adverse outcomes. At Hemingway Medical Spa we use a Skintel® Melanin Reader™ which measures the amount of melanin in the skin, which contributes to more accurate assessment and laser settings.